This is the ideal HD beauty sponge for TV, film, print, beauty, wedding and social, or daily wear makeup. Finally, a friendly, reusable, easily held sponge that can be used dry or wet with any creme-based makeup. The GlamourGrip is soft when dry for standard application, but when it's moistened and expanded with water, it is eve softer! This wetting technique is preferred by many HD makeup artists who wish to apply and ultra-light application, and want HD camera ready flawless results. Simply wet sponge with water, squeeze out excess moisture and pat sponge with a paper towel so it's ready for makeup use. 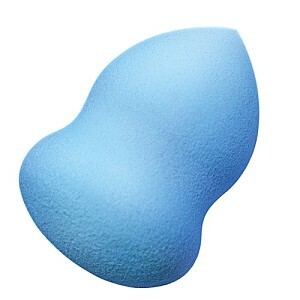 To clean your GlamourGrip sponge, simply wash with warm water and soap that is usually suitable for your makeup medium. We tend to recommend mild, grease cutting, anti-bacterial liquid dish soap. Artists all over the world call this non-latex, ergonomic beauty tool simply fabulous. We call it, GlamourGrip.